1. I know which ASC subject I want to do. How do I ‘buy’ my subjects and get started? On the Subjects page, choose from the list the subject you would like to ‘buy’ by clicking on it. You will be taken to that subject’s page. Each subject has its own page with information on that subject, associated subjects, learning outcomes and course content. Select a quantity and click “Add to Trolley” to include this subject in your order. You will be taken to your trolley, where you can see all the subjects in your order. Repeat steps 1 – 3 for each subject that you would like to ‘buy’ and complete for your certificate. NB: The maximum number of subjects per learner is 6. 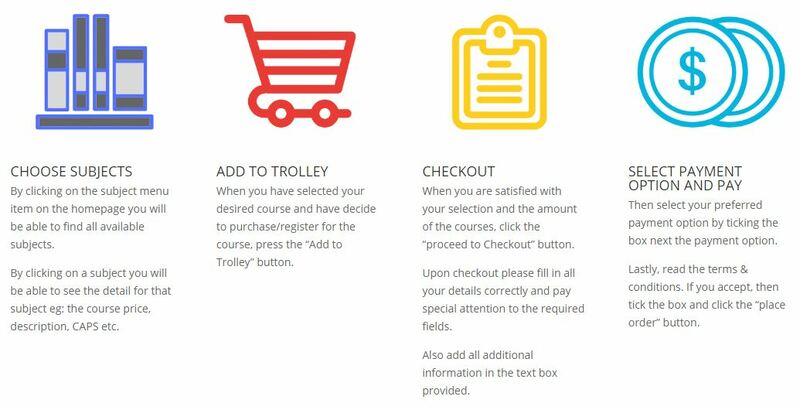 When you have selected all your subjects and added them to your order, click on “Proceed to Checkout” on the Trolley page. Complete your Billing Details and fill in any additional information you’d like to include for your order. Then, select which payment method you’d like to use. Note: Here, the details you enter will be the same details you use to login and access the online learning platform, iTut. Check the box to confirm that you’ve read and accepted the Terms and Conditions before clicking on “Place Order”. Your order has now been placed. When Matric Works has received your payment, you will receive a confirmation email with the details of your Order – as well as a link to login to your iTut profile. iTut is the online learning platform you will be using to complete your subject courses. Electronic Funds Transfer (EFT) – Using this option, customers make payment by depositing money directly into our bank account. Payment does not reflect immediately and so it can take up to 5 working days for payment to be confirmed. Only once payment is confirmed will customers receive a confirmation email containing the information they will need to complete their course. Credit Card – This option allows customers to make payment using their credit card or valid debit card. The process is secure and convenient – payment is instant, so customers can access their course content and begin studying immediately. 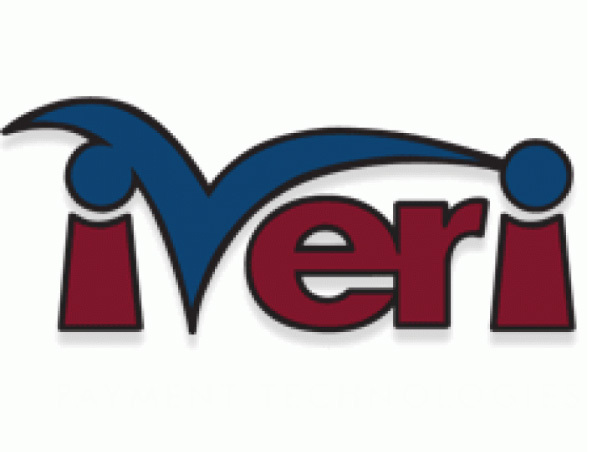 We, the merchant, are not able to see or access customers’ confidential credit or debit card information. 4. I am paying via "EFT or Cash Deposit". How do I fill in the Nedbank Deposit Slip? Please note that Matric Works banks with Nedbank. When you place your order, you will receive an Order Confirmation Email from Matric Works containing the details of your order, as well as our bank account information. Fill in the Date in the top-right corner of the deposit slip, e.g. “10|11|2016” for 10 November 2016. In the top-left corner, write the name of the branch where you are making this deposit, e.g. “Nedbank Sandton”. Below the Branch Name, fill in “Interactive Tutor (Pty) Ltd” in the Credit field. Interactive Tutor, aka Media Works, aka Matric Works, is the person/entity you are paying. Sign the deposit slip in the Signature field. Write your contact number in the field labeled “Depositor’s Contact No.”. In the field labeled “Depositor’s Name and/or Reference”, fill in your Order Number (provided by Matric Works in your Order Confirmation email). You must use your Order Number as this reference number so that we know you have paid. Fill in Media Works’ Account Number in the “Account Number to be Credited” field. Our account number is provided in your Order Confirmation Email. Fill in the Cash Amount in the area below the Date field, e.g. “1,500|00” for one thousand and five hundred rand and no cents. This number must reflect the amount of money you are paying to Media Works for your Order. Fill in the Total Amount that you are depositing. This number must equal the Order Total for your Order, as shown in your Order Confirmation Email from Matric Works. Check that all of the information you have filled in is 100% correct. When you’ve completed your deposit slip, present it – along with your cash – to the bank teller. He/she will process the deposit and present you with a receipt. Media Works will receive a notification when your payment is received. 5. Can I cancel my Order if I need to? If you have placed an order and chosen EFT as your payment method, you are able to cancel that order before payment is made my clicking on “My Account”, going to your “Order History” and clicking on “Cancel Order”. a) Payment has been made and the Order has been confirmed. The learner has received an email containing their iTut login information, but they have not logged into iTut yet or begun using any of the course content. If this is the case – contact us to Cancel your order. Do not login to iTut or open any of the course content. b) Payment has been made and the Order has been confirmed. The learner has received an email containing their iTut login information and they have logged in and begun using the course content. If this is the case – contact us to Cancel your order. Your access to iTut and any course content will be revoked and you will incur an admin fee of 5% of your Order total. Please note that customers can only cancel their Orders under these circumstances up to 10 calendar days after their order is confirmed and their iTut account is activated. 6. Who Qualifies for the Amended Senior Certificate (ASC)? A recognized equivalent qualification obtained at NQF Level, which requires two official languages. Adult learners who are 21 years old or older with an incomplete Senior Certificate qualification. Adult learners who are 21 years old or older with an incomplete National Senior Certificate and whose School-Based Assessment (SBA) validity has expired. 7. Can I take any combination of subjects that I want? 8. How do I apply to write the Examinations? The Amended Senior Certificate Examinations take place in May / June every year. If you meet the qualifying criteria outlined above and wish to take the examinations and obtain the certificate, you must register for the examinations no later than end of October, to take the examinations the following June. For example, if you want to take the examinations in May / June 2020, you must apply no later than 31 October 2019. Learners wishing to write these exams can register at any provincial education office, which includes the provincial head office, district offices and circuit offices. 9. Can I access past Exam Papers to prepare for my exams? Yes, absolutely. Click here (http://www.education.gov.za/Curriculum/AmendedSeniorCertificate.aspx) to find past exam papers for the ASC 2016, and for the NSC as far back as 2008. Using past papers is an excellent way to prepare learners for their ASC examinations and is highly recommended. 10. Is there a Guideline available for the Examinations? Yes, the Department of Basic Education has compiled an Examination Guideline for several of the available subjects, and made it available on their website. Click here (http://www.education.gov.za/Curriculum/NationalSeniorCertificate(NSC)Examinations/2015SCExaminationGuidelines.aspx) to locate these guidelines. iTut, which stands for Interactive Tutor, is the online learning platform developed by Media Works, which learners will use to complete their studies. iTut is accessible online and as an app. The app allows learners to download all of their course content and store it locally on their device. This makes it possible for learners to access their content even when they do not have access to an internet connection – the learning never stops with Matric Works. 12. I have more questions, how do I get in touch? Please feel free to get in touch with us anytime. We are here to help. You can get in touch either by clicking on the “Contact Us” link in the menu, or by emailing Matric Works at: info@matricworks.co.za. 13. I wrote my matric in 2013 but did not gain university exemption. I would like to rewrite some of the subjects that I failed so as to gain entry into university. Will writing the ASC help me? The ASC exam certificate does offer the opportunity to enter higher education institution, provided the applicant meets the minimum entry requirements of the institution, with regards to required subjects and symbols. 14. I failed 2 subjects when I wrote my matric in 1999. If I write the ASC examinations will I be able to combine my 1999 SC results with the ASC results? Yes you can, but keep in mind that only selected subjects are available and you have to comply with the subject choice requirements. 15. I wrote 3 subjects in the 2015 ASC exams and wrote 3 more in the 2016 ASC exams but on my statement of results it is written ‘incomplete’. Must I write more subjects? Not necessarily. You have to apply for a combination of results and you have to comply with the subject choice requirements. 16. Can I access higher education with my ASC qualification? Yes you can. The ASC examinations are administered by the Department of Basic Education, and the Certificate is awarded by UMALUSI. The Matriculation Board regulates admission to the majority of public universities. The Board is also responsible for administering the matriculation endorsement and exemption requirements in accordance with regulations. Admission to some Higher Certificate and Diploma programmes offered by some universities of technology and other institutions is determined by the individual institution. The Matriculation Board or the institution of your choice will determine whether you fulfil the requirements for tertiary education. It is your responsibility to enquire from the relevant body whether you meet the entrance requirements. 17. How and where do I register to write my ASC exams in 2020? If a candidate is self-studying, they can register online on their province’s education department website. Those who are affiliated with an Adult Learning Centre will register at the institution. What do I need to register for the exams? 18. Will I need to purchase any additional material? 19. Where can I find the ASC national examination timetable? - How does a student find out who their tutor is? How Does the student submit the returned exam and assignment? Is the exam written onsite under exam conditions? Is there an SLA on responding to students email? Is there a maximum amount emails the student can send to the tutor?